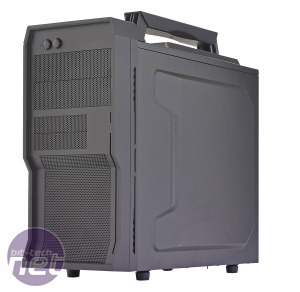 NZXT cases often look unique and its latest micro-ATX offering, the Vulcan, is no exception. Its angular fascia and rugged, chunky side panels won’t be to everyone’s taste, but they certainly make the case look striking. The Vulcan has more going for it than a unique profile, though, as it’s packed full of useful features, despite being one of the smallest micro-ATX cases we’ve seen. The first of these is a dual-channel fan controller, which is located on the top of the case’s front panel. Each channel is rated at 8W and is fully variable, making full use of the speed range of the included fans from full speed to just ticking over. 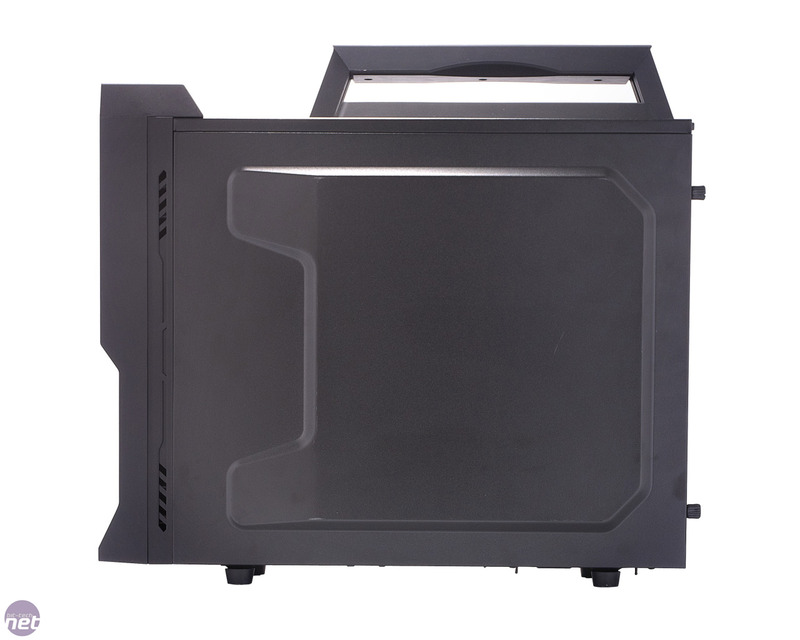 The top of the case is also dominated by a large bulge that can house up to two 120mm fans, although only one fan is included out of the box. Looping over the top of this bulge is the carry handle that NZXT ships with the case. It’s attached by four rather puny-looking screws, but it held firm no matter how much shaking or swinging we subjected it to. If you’re not planning to move the PC regularly, the handle can also be removed. Meanwhile, at the bottom of the angular, jutting front panel is a meshed area, which acts as an intake for a single 120mm fan. The intake is fitted with a dust filter, but annoyingly you’ll need to remove the entire front fascia of the case to clean it. 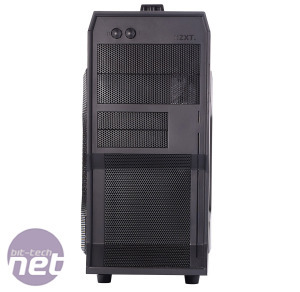 The left side of the case is made almost entirely from mesh and has a mount for a 200mm fan. This arrangement means that the Vulcan is very porous as far as airflow is concerned, but it also allows noise to find its way out without a fight. This is unlikely to be an issue if you use the Vulcan to build a compact LAN PC (noise isn’t often an issue at LAN parties), but it could get annoying if you use the system inside the Vulcan every day. 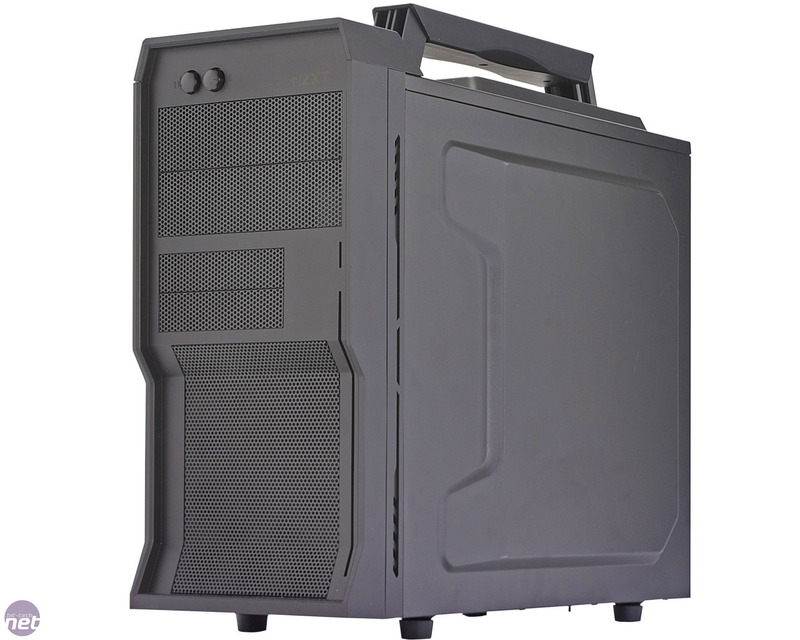 The mesh side panel doesn’t have a dust filter either, although the Vulcan’s standard fan configuration should result in a relatively neutral internal air pressure, so dust shouldn’t be too much of an issue. 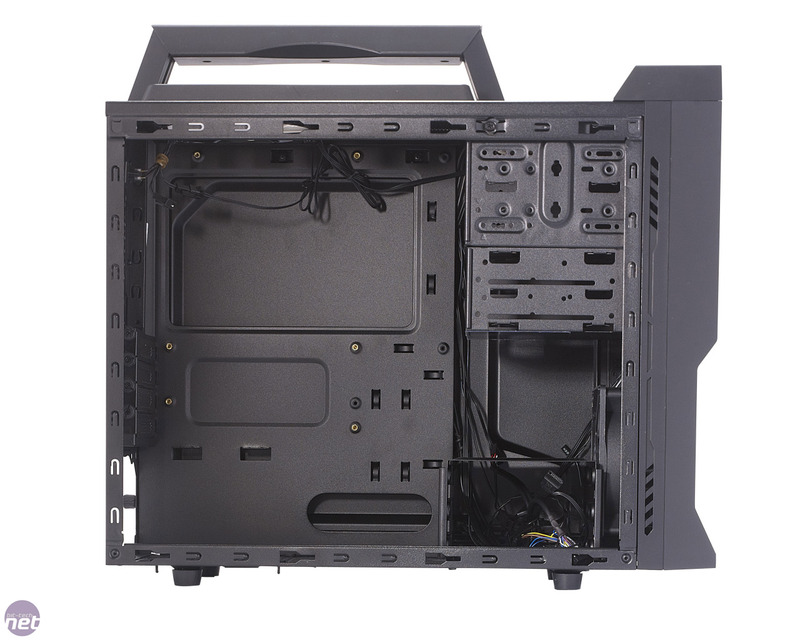 This could change, however, if you decided to add more exhaust fans to the case. Internally, the Vulcan looks smart, thanks to its matt-black interior and lack of clutter, which is a boon given that the internals are visible through the mesh side panel. To help you keep the internals tidy, a number of cable-routeing holes have been cut into the motherboard tray. 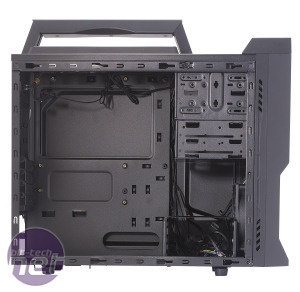 There’s also a fair amount of room behind the motherboard tray for stashing wires, thanks to the angular bulge in the case’s right-hand side panel. 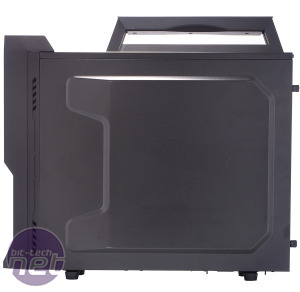 Interestingly, NZXT has also chosen to fit the Vulcan with only two internal hard disk bays, which are located at the bottom front of the case. This may seem slightly stingy compared with other micro-ATX cases such as the Antec Mini P180, which has six hard disk bays, but we think it’s a canny decision. 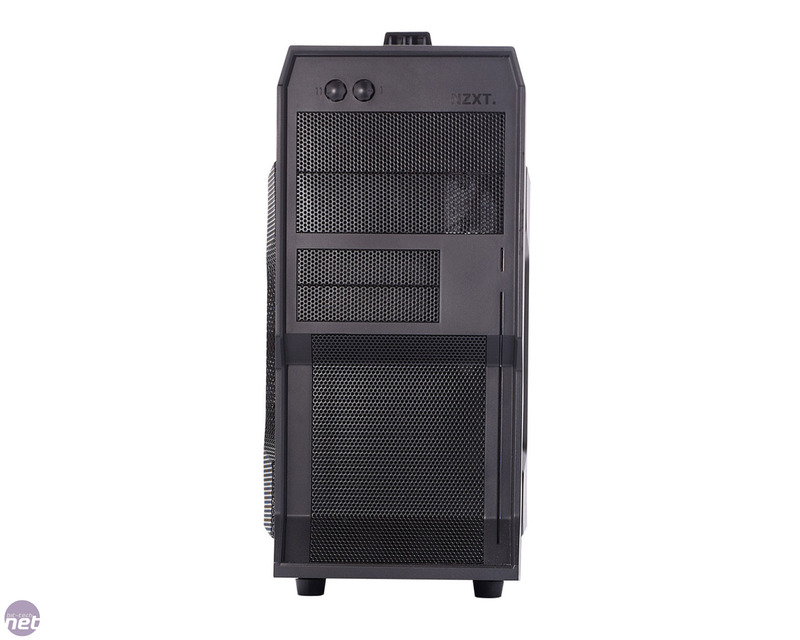 While NZXT bills the Vulcan as a LAN gaming case as opposed to an everyday PC case, few people need more than two 3.5in drive bays. By providing only two hard disk bays, NZXT has cut down on material costs, and the smaller hard disk cage leaves more room for long graphics cards too. Seriously big case gets the silent treatment.